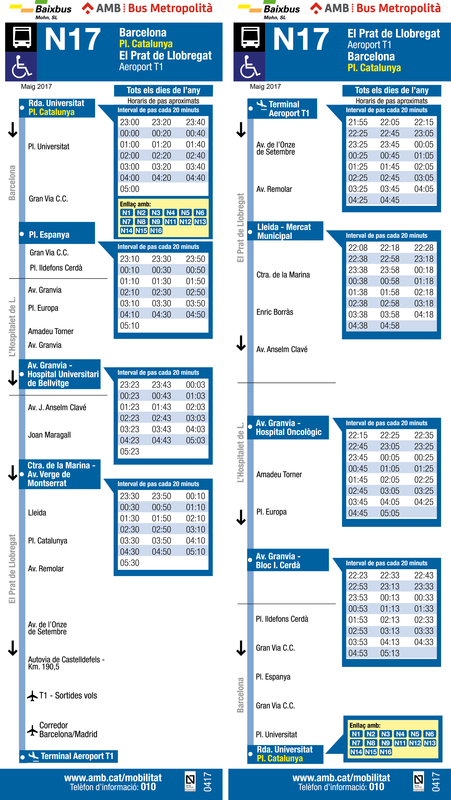 N17 Nitbus is a night bus that operates between Plaza Catalunya and Barcelona airport terminal T1 from 23:00 to 05:00 hours in the morning and from Barcelona airport to Plaza Catalunya from 22:05 to 05:05 hours in the morning. From T1 airport terminal you can take a free shuttle bus to T2 airport terminal. 2018 night bus N17 ticket price is €2.20 for a single ticket to airport (2 zones). The N17 night bus stops at every bus stop on the route.